President Robert Mugabe is being kept in power by “power-hungry looters”, hence Zimbabweans must take the chance to vote the 93-year-old leader out of office, former Vice-President Joice Mujuru said yesterday. Mujuru, who is opposition National People’s Party (NPP) leader, said this while visiting party officials admitted at Parirenyatwa Group of Hospitals’ intensive care unit after being involved in a car accident on Saturday night. The former VP – who served under Mugabe for over 34 years before she was unceremoniously kicked out of Zanu PF and government on allegations of plotting a coup – said the decay of Zimbabwe’s health delivery system was a sign the President cared less about the plight of citizens. “At 93, what do you expect from him? He just does not care anymore and I doubt he still understands what is expected of him in terms of providing solutions to address the economic rot which is causing this decay of social service delivery,” Mujuru said. She also blamed Zimbabweans for allowing Mugabe to hold them “hostage”. “Mugabe has always said if Zimbabweans tell me to go, I will go, so he is there because we have not told him to go. I believe we should tell him to go … he is being kept in office by people who have looted this country and they think the only way to escape is by keeping the old man hostage in office,” the NPP leader said. She accused top government officials of abandoning their posts to engage in political mudslinging and the power scrap currently engulfing Zanu PF. Mugabe frequently flies out of the country mainly to the Far East for what officials claim “routine medical check-up”. Reports indicate Mugabe was constantly receiving treatment for an undisclosed ailment at the state-of-the-art Gleneagles medical facility in Singapore, renowned for specialist treatment, at taxpayers’ expense. Early this month, Mugabe travelled for medical treatment leaving local health personnel on a strike, demanding better working conditions and pay. Government this year allocated the Health and Child Care ministry a mere $281 million, with $222 million going to employment costs, leaving $55 million for infrastructure, medication and equipment. In contrast, Mugabe’s office received $187 million with employment costs at $98 million, leaving his office with an unchecked budget of $89 million which funds mostly his travels and medical needs. Mugabe’s expenditure is not subject to auditing and in the past few weeks he has been flying non-stop on a chartered plane with one trip to Singapore blowing over $1 million. The former Vice-President came face-to-face with the deplorable conditions of service and health delivery after being told by accident victim and NPP Makonde chairperson, Levison Shumba, that nurses had encouraged him to seek treatment at a private hospital. “I fractured my leg in the accident and I need an operation, but nurses have told me that if I don’t get this done at a private hospital, it would take way over a month before I can be attended to,” Shumba told Mujuru. 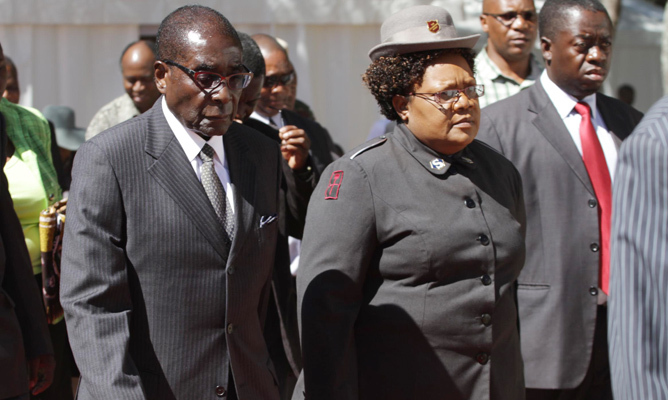 Mujuru said Mugabe, whose sister Bridget spent no less than four years on life support at Parirenyatwa, was out of touch with reality. “I don’t think he knows the state of this hospital, from the staff that is demoralised, the bed linen is not inspiring and service is absent, how can one have to wait for a month to be attended for multiple fractures on a leg? Does he know how things have changed since the last time he was here as a patient? I don’t think so,” the ex-VP queried. Another NPP official and renowned surgeon, Samuel Mvurume, also admitted at Parirenyatwa, was injured in the freak accident while trying to help victims of a crash in Chinhoyi on Saturday night.